And what is their excuse??? Two israeli soldiers.... Two israeli soldiers verses a whole country's blood worth... Innocent children, women and men.. Unarmed... It is justified to use banned weapons.. It is justified to slaughter people aimlessly... They are not even targetting Hizb Allah, they are unable to despite all their armaments and radars? I would like find a word to describe the Arab leaders but it will not be confined to one word or one description, but many and all ugly. I guess that sums it up. Their opinions are not those of the people of their countries, not the feelings, not what the majority of the people want. I personally cannot blame anyone more than our own leaders for what is happening in the middle east, I cannot blame except for those amongst us who sold their origins and Religion and adopted what is not theirs.. They are the ones to blame first hand. They permitted others to step over us. What we all want now is to go stand up for tyranny. Israel and those backing it up will not stand a chance in front of the anger and hatred that is spilling out of each individual in this nation. The anger and hatred are seeds they planted and continuously plant and nourish so well! The American Government has always been Israel’s back up, it is no secret. Hatred and anger do not arise out of the blue. It is common sense. It is about time the American people and others understand that. It is about time to use some common sense. When someone defends themselves with the most minimal resources possible they are described as being terrorists! I just do not understand how. How many children from the Israeli side have been slaughtered versus the ones from the Arab side? Today, July 30th about 30 children have been dragged out from under the ruble of one mere building! And the excuse was Hizb Allah were launching missiles from that area! If so, where are the men from Hizb Allah that were targeted and supposedly died? Where are the missiles or the remnants of ammunition or artilary they were using? Not a single man from Hizb Allah was in the area, no one but children, women and elderly people were found dead in that single building. Thank God they were all sleeping. Now they are all between the kind hands of God, away from tyranny and injustice. May they all rest in peace. Our unworthy and disappointing leaders are dragging us to God knows where. They managed to divide us well. They managed to dismantle what was once long ago unshakable unity; they sold our dignity for their personal gain. I know that if the Arabs unite no one and I mean no one shall be able to stand in our way. We want nothing but to be left alone. We are all sick and tired of unwanted intervention in our matters. Our leaders are faithless. If they had strong faith they would never fear anyone and would know that victory shall with no discussion be ours, but what can I say. For years they have led to degradation of the Arabs and Moslems and are continuing to do so. Those amongst the Moslems who are aware of the gradual signs leading to the day of Judgment would know that this was unfortunately coming. Prophet Muhammed (Allahoma Saly wa salem 3aleih) informed us that there shall come a time when those who lead the Moslems shall not be worthy of their positions. Those who have abandoned the true ethics of Islam and have adopted new attitudes that do not belong to them, those who have abandoned their origins of faith and roots shall lead all of us to what is happening now and will happen later. Kam min fi2atin kaleela ghalabat fi2atin katheera beithn Ellah… roughly meaning that a small number may triumph over a large number with God’s permission… and also “in tansoro Allah yansorkom” also roughly meaning that when we obey Allah and follow his commandments He will always support us and guide us to victory. Now if we all look at our nation and what it has come to, faith wise, we will realize that many sectors of our community fear people rather than fearing God… We need to reconsider too many issues and we need to have more unity and faith… But it seems that after all there is one man in our nation that is sticking to those beliefs and acting accordingly. Hassan Nasr Allah is this man. Nasr Allah is a man of Faith and so are his followers and supporters, he is respectable and he does not take orders from anyone. He fears no one but Allah, the creator, rather than super powers amongst creation. What he has done was not wrong; israel’s reactions are as usual over reactions, in other words exaggerations and are as usual backed up by the United States government. However it is quite obvious that those two Israeli soldiers are NOT the reason why all this is happening. Rather, it is happening because it was going happen anyway. How many Arabs are in the Israeli prisons, and since when? How were they taken? How many killed, from women, children, elderly, young and old men??? Israel does not even abide to any of the international sanctions or laws… How come and why? Same goes for the US … they too are not tied down with any sanctions and no one dares do anything about it. This is what I really do not understand. Why do countries of the world accept this discrimination in rules? Why are these two countries the only two that have more rights and privileges over others? Why can they do what ever and when ever and no one dares stand up from them? Why? Israelis want to take over the Middle East, it is no secret, and with the United States’ approval and back up. We all know israelis openly believe and teach their young ones at school the following phrase, or in other words dream that they so much want to make come true: dawlet israel men el Nil lel Forat, meaning that the state of Israel is from the Nile till the Euphrates. Those who say America is innocent of this war are either not properly informed or are not following up the day to day events and roles America is playing in this and many other issues concerning the Middle East. July 22nd, 2006 Condoliza Rice issued a statement that proves what all of us Arabs are accusing the israelis of and of what the US is backing up. She said, today we are seeing a new outline of a “New Middle East”. That is the plan they are executing. It is a statement frequently used now. Again not a secret or surprise for us. It has been obvious for many years. But as I mentioned before knowing is something and seeing it happen is something different. It makes me feel sick to see that our leaders are so pathetic. They dishonor us all. Last but not least, I would like to add, God be with the Lebanese, and before them, the Iraqis and long before those the Palestinians, and many others world wide… GOD BE WITH US here in the Middle East. As long as our leaders are standing silent watching this happen, our turn is sure to come. As long as our leaders are always in conflict, our turn is sure to come. Al hamd Lillah that we have someone like Hassan Nasr Allah in our Ummah. I pray there would be more of him, only then will we be able to segregate ourselves from manipulation and unwanted intervention. Maybe then our dignity and respect shall come back to us… maybe then we shall really become united. Forgot to tell you all, that is if u are interested to know, I was informed I am carrying a baby boy!!! I am quite happy, I was hoping for one... Not that I do not like girls, I do, but i have many reasons for wanting a boy, maybe some other time though.. I would appreciate it if you suggested names, but please bear in mind; I like names resembling pple in Islamic History. Men who left positive marks. I named my son Omar taking Omar Ibn Al khattab as an example and praying and hoping my son would have his traits and other postive traits from The master of manners and ethics of course, Prophet Muhammed (Allahomma Salywa salem 3aleih). Initially I had both Hamza and Bilal in mind. My son keeps repeating Hamza all the time when I bring the subject of names up. He actually interupts me and tells me Hamza ya Mamma, Hamza is the baby's name.. He likes the name which sometimes makes me feel i have to respect his will and name the new born Hamza as my Omar wants. I feel he really likes the name. Well, well well!!! What a “not” surprise. Mr. Bush is using the veto in order not to condemn israeli attacks on Lebanon… This man does not cease to marvel me! nor do the israelis, and last but not least, sadly, nor do the Arab leaders cowardly behavior either!!! Anything out of proportion will never shock me. It is just typical israeli attitude... We got used to their injustice and over reactions. We got used to their and their allies nonsense and injustice.. But God is just and fair... That is what counts at the end. What is there to say to the insensible of this world? 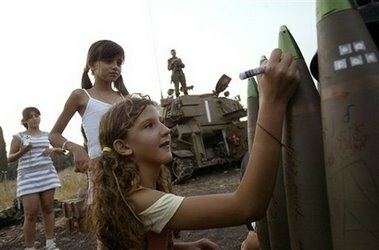 Gifts from israeli children to the Lebanese... We (US) name the dates history started...the day before the Israeli soldiers were taken...two Lebanese citizens were taken by Israel...now illegal warfare? Israel has attacked UN posts over and over killing many now. They have bombed all media stations including christian...what will make these madmen stop? They are using up the weapons and increasing the stock values of those companies...which we pay for...they choose...stocks go up for those companies...get rid of some more poor people...US media only shows the Israeli perspective...never Lebanon. They want war...more weapons...this will be the end for Israel....too bad. Just like old Rome...the Israelis then were the occupying army. However, Bush is the worst president i personally have come across so far... I cannot believe the evil in this man. Worst of all his insensibility in choices and decisions. So much bloodshed has happened because of him and he sure has a heavy burden on his shoulder... Maybe he does not feel it's weight now, but he sure will after he dies and GOD has a word with him. That for me is enough to know, no punishment here on earth is enough for him and those who agree with him. wonderful post! i don't understand why it seems that israel and united state have permission to kill and that's it and hiding behind legality's flag. Thank you my dear. You cannot imagine the pain i've been continuosly feeling lately. I feel as if each person dying there and each person suffering is family. Each child my own. They are in a sense or the other. Least of all they are as much human as you and I, they have the right to live in peace, not die the way they are, not live in terror the way they are.. And for what???? Israel and US do not hide behind legality flags Leandra, they do not abide to any laws my dear. Not just now, it's been like this for ages if you go back and look closely to events. That precisely is what really bothers me. The rest of the world is supposed to abide to rules while both these twins don't.. Actually to me they are but one ugly, evil, nasty, disgusting entity. They grow to be uglier by the second. mashallah tabarakallah! alf mabrook and inshallah he comes a healthy, strong boy and inshallah his future is under the shade, guidance and love of Allah ya rab! ameen ameen ameen. Hamza is a nice name. But I have to just say that just a few days ago I meet someone by the name of 'Noor al-Hudaa'. Subhaan Allah, I was struck at how beautiful that name is! I am amazed why I haven't heard it before. Inshallah when I do have a child myself I'm going to call him Noor al Hudaa. And it works on both boys and girls! But I guess it doesn't work on the sahaaba theme you're looking for, although it does have a very beautiful Islamic meaning. Yallah 3ala kulin, inshallah khair whatever you name him. wassalam Congratulations. Our oldest just turned 1, youngest is 3 months. For a girl.....I like Khadija, but I know it is pretty common. I also like Souheila. I like Amr, it is the name of Amr Ibn Al-3as radya allah 3anho and at the same time it sounds musical to name your 2 kids, Omar and Amr. Anyway, rabina yetamem be'7air and you have a pretty and heathy baby regardless the name:) Congrats!!!!!!!! very blessing news :) Doshar, Omar keeps nagging for Hamza... very strange how he is so attached to the name, it is affecting me some how.. But I am never gonna decide anything anyway till I deliver and insha'Allah. Jane, It is as u said, I will know when i see the baby, but I would not want to ignore Omar's wish either. Will ask him again when I deliver. It will make me happy if Omar chooses his brother's name.. I can't wait! I also like the name Amir (which is mostly Amr in middle east). Its already proposed. A friend of mine was pregnant and she was asking for any name suggestions for a baby boy, I suggested Fakhri, which also was by accident one of her favorite names too. I also like name Saeed. There is also a name Farid and Faraj. I seemed to be attracted for the names with letter F :). I like names when they are in harmony with the last names, or father’s name in case of middle east. First time to see you here, nice of u to visit.. Thanks for the lovely suggestions.. It is as i mentioned before, I guess the name will come with the baby... But thanks anyway. Thanks for you wish for a healthy baby... I pray so too. Thank you sweetie.. Not sure i hear that name before. different countries have many different names.. For us dawn meas fajr. and it is a name used but for girls. Oh well, we'll have to all wait and see.. Just keep praying fo me please... Seher in Azeri means "morning". I dont know whether there is a connection between Azeri and Indian. but we seem to have common words. Puppy. Omar and Hamza are 2 beautiful names mashAllah! I know 2 little brothers who are names Omar and Hamza. Thank you my dear, I am getting attached to the name Hamza alot lately. The reason being is Omar keeps insisting on it for some reason, and no matter what names I bring up, he keeps telling me Hamza ya mamma Hamza! the last couple of generations got away living in this style and this lead to the ummah falling deeper and deeper into sleep. Everything from Allah is khair and this instability and escelating chaos in the ummah can be nothing but khair. Ukhti, with instability comes change. If there is anything I have learned it is that this ummah will never wake up until it gets slapped across the face really hard. If war doesn't come then change will never come and people will keep on saying "yallah ma3lesh, 2sh nesawi". Soon inshallah people will realise that this laid back attitude will lead to nothing, nay, it will make things even worse. So alhamdullilah for everything. The deeper we fall the closer our victory will be inshallah. We have the strength, the men and the women, we have resources and lands, all what we need is to fall deep enough so that this ummah will finally wake up and take its full potential. wassalam The world has really become a lot harder to comprehend; all the meaningless violence that we see all around, and the world is but a bystander. Can any rational human being explain this apathy. As for Mr. Bush, he's sending humanitarian aid to Lebanon on the one hand and selling 'bunker buster' missiles to Israel! He wants the show to go on...I guess. And so do we...committed voyuers to this carnage! Abdul Rahman, al kheir (goodness) comes from Allah, but evil and badness are our doings... We need to really start praying hard that Allah changes our heads of state, or get gathered and remove them some how. The only one i see with true dignity is Hassan Nasr Allah now. He is the type of leader we all need ... a man who fears non but Allah. All u said was write about having the resources, but no one is putting them into action in the proper manner.. no one is investing them.. Our problem is our heads of state ya Abdul Rahman. U said it all dear.. U said it. I just do not get it how the American people do not see that. Why is it that we all see it and they don't? He does want they show to go o id, he does, it is all pre-planned. They both want to occupy and take control of the Middle East.